The gap year and an opportunity to travel seems, to many of us, a relatively new phenomenon – a chance for our children to broaden their experience of the world. But there is nothing new in this. Georgian polite society would send their sons to the Continent once they had completed their formal education. The Grand Tour could last anything up to five years. Young men and their tutors would visit the great houses, palaces and cities of Europe. There they would admire the ruins of antiquity and bring back trophies of their tour – objects which were both genuine and imitations. Examples of these pursuits can be found in the collections at Petworth House in West Sussex where the 2nd Earl of Egremont (1710-1763) was a particularly cultured Grand Tourist. The late Georgian period (1760-1800) would be defined by Neo- classical taste informed by the newly discovered rich Roman interiors at Herculaneum (from 1748) and Pompeii (from 1758). These cities had been hidden from the world by the eruption of Mount Vesuvius in AD 79. 18th century excavations revealed exquisite interiors with delicate symmetrical decorative motifs which inspired artists and designers back home in Britain. 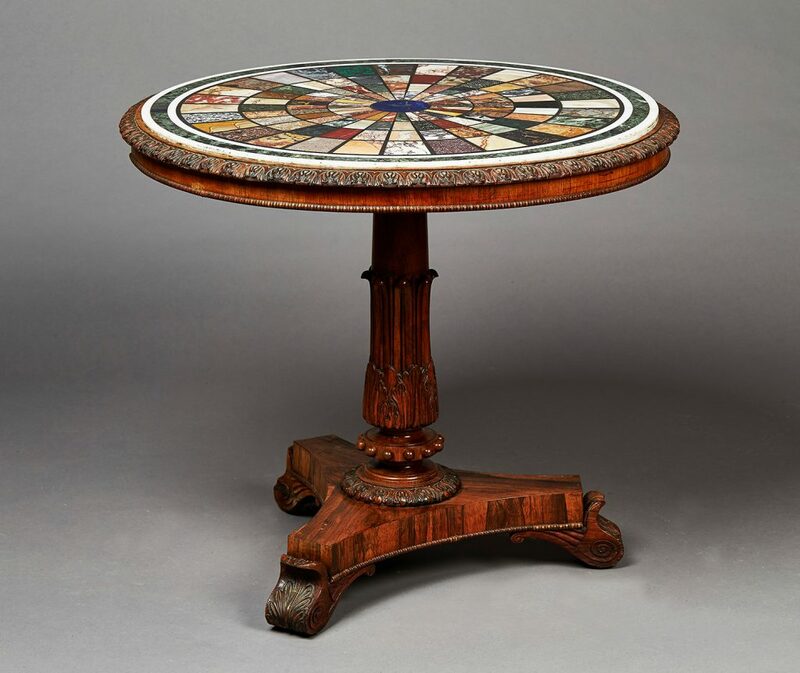 The Neo-classical specimen marble table illustrated is a good example of this and was probably designed by Gillows of Lancaster. By the mid-18th century Gillows had acquired a reputation for manufacturing furniture of the highest quality and by the late 1700s the firm had offices in Lancaster and London. There are records of Gillows supplying tables to Stephen Tempest to support marble slabs purchased by him in Italy. However, this particular table was most recently owned by the late Baroness Herries of Terregles (1938-2014). Lady Anne’s father was the 16th Duke of Norfolk and she had grown up at Arundel Castle, the Norfolk’s family seat in West Sussex. 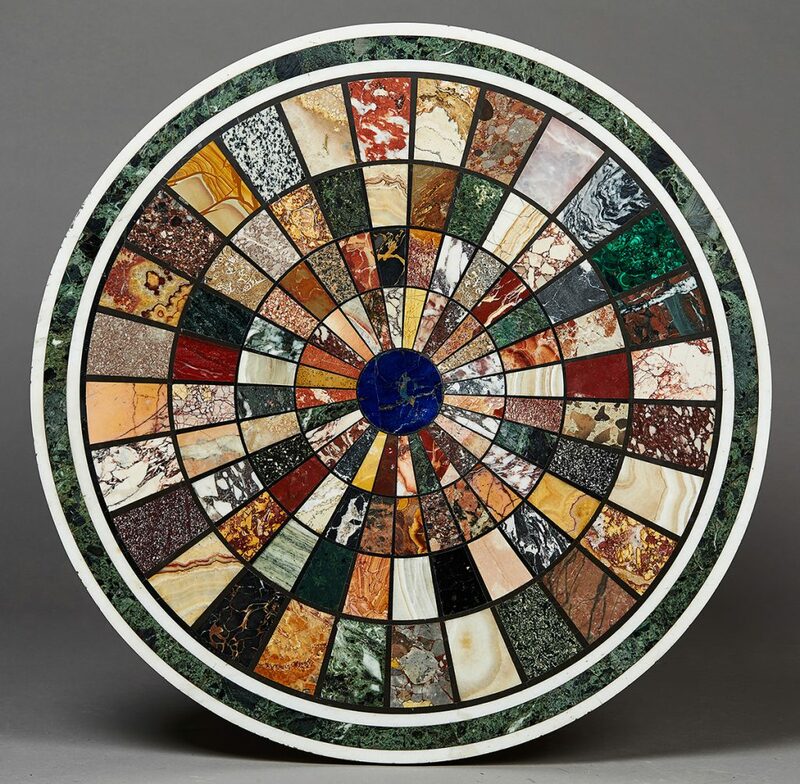 The circular top is inset with radiating bands of specimen marbles, including lapis lazuli, malachite, porphyry and agates, within a border of verde-antico The table’s base is delicately carved with a continuous band of acanthus leaves, raised on a carved tulip cusp stem with a beaded knop, the triform base has carved scroll feet fitted with castors. 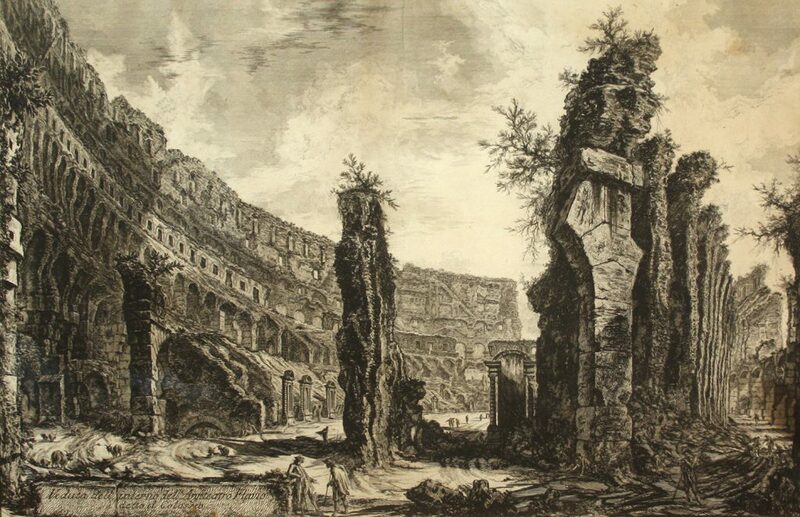 The scene depicted by Giovanni Battista Piranesi (1720-1778) is typical of his ‘Vedutes’ (views), especially of Rome, which once again became an important artistic and cultural centre in the 18th century. Piranesi was an Italian artist famous for his etchings which would inspire a generation of philosophers, architects, artists and academics. These objects speak loudly of our shared European heritage. I am confident and hopeful that the continuous philosophical and cultural heritage, which forms part of our shared narrative with the nations of Continental Europe, will continue to bless us as our relationships with one another evolve. Learning and culture were considered and remain important markers of civilisation in Europe. An intimate exhibition ‘The Woodcut: from Dürer to Now’ has just opened at the Pallant House Gallery, Chichester. It examines the art of the woodcuts and wood engravings from the time of the Renaissance to today. To produce a woodblock print the artist’s design would be pasted to the block so that the engraver could cut the image into the wood. The printer would then print the image. The first woodcut in the exhibition is an image by the Renaissance artist Albrecht Dürer (1471-1528). 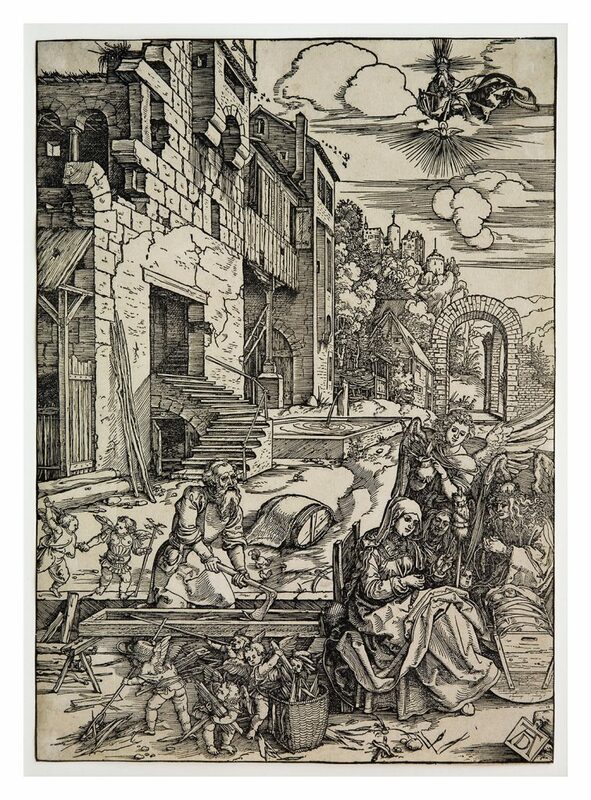 Produced in 1511, it comes from a series of prints he made illustrating scenes from the life of the Virgin Mary. Dürer’s treatment of the scene is revolutionary. The infant Jesus sleeps whilst Mary spins yarn in the company of Joseph and two attendant Angels. The group are watched over by the Holy Spirit depicted as a dove in the heavens. There is a gentle domesticity to the scene in contrast to the urgency of their flight from Herod. Note also Dürer’s treatment of perspective in the buildings and landscape. Straight grained cherry was often used in the production of Japanese woodcuts as it allowed for fine detail to be carved. As many as ten blocks were used to achieve the diversity of colour. At each stage of the process proofs would be made for approval. One of the best known of all Japanese woodcut designers is Utagawa Hiroshige (1797-1858). Hiroshige’s landscape prints are internationally acclaimed and are amongst the most frequently reproduced of all Japanese works of art. They are defined by their unusual compositions and humorous depictions of people involved in everyday activities. His exquisite observation and depiction of weather, light and season are exemplary. Hiroshige’s work proved hugely influential for many leading European artists including Claude Monet and Vincent van Gogh. Hiroshige combined his print making with his inherited position as a fire warden. In 1832 he was invited to join an embassy of Shogunal officials on a journey which allowed him to observe the Tokaido Road, the Eastern sea Route which followed the coast through mountain range to Kyoto. 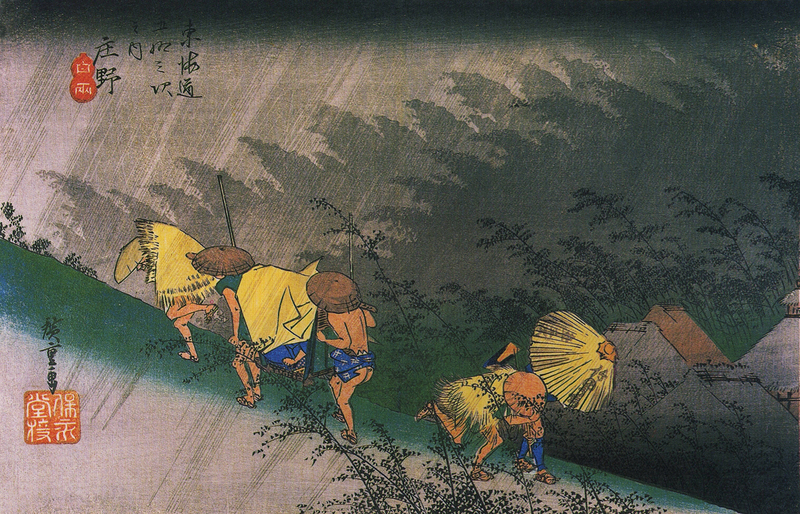 The resultant series was called ‘Tokaido Go-ju-san-Tsugi’ (The Fifty-three Stations of the Tokaido), from which ‘Travellers surprised by sudden rain (Shono haku-u)’ is taken. It portrays farmers and porters running for shelter as the sudden downpour of rain darkens the sky and obscures the mountains. 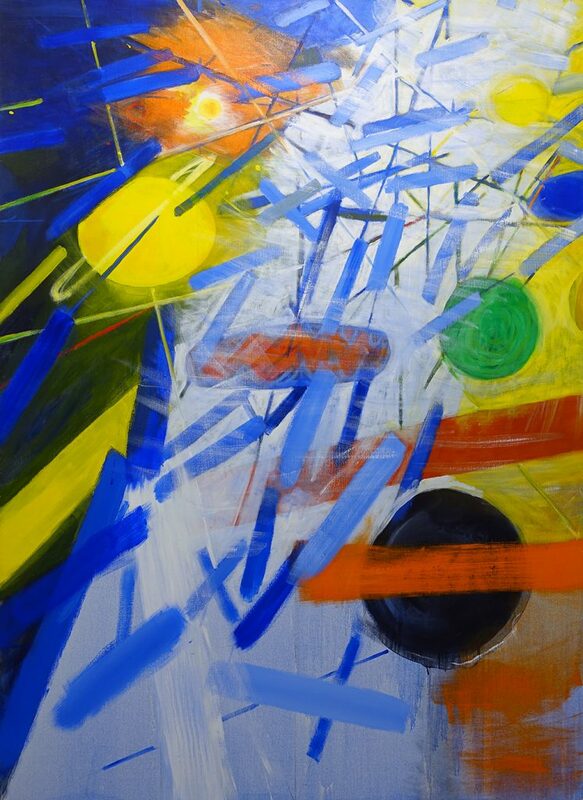 The figures, angle of the rain and the wind in the trees, lends the image a sense of urgency and movement. In the early part of the 20th Century there was a revival of woodblock engraving in Britain. The strength of contrast in the black and white, and the softness of line, seemed to articulate something particular to a generation who had lived through the First World War. Ben Nicholson (1894-1982) was a leading artist in British Modernism. 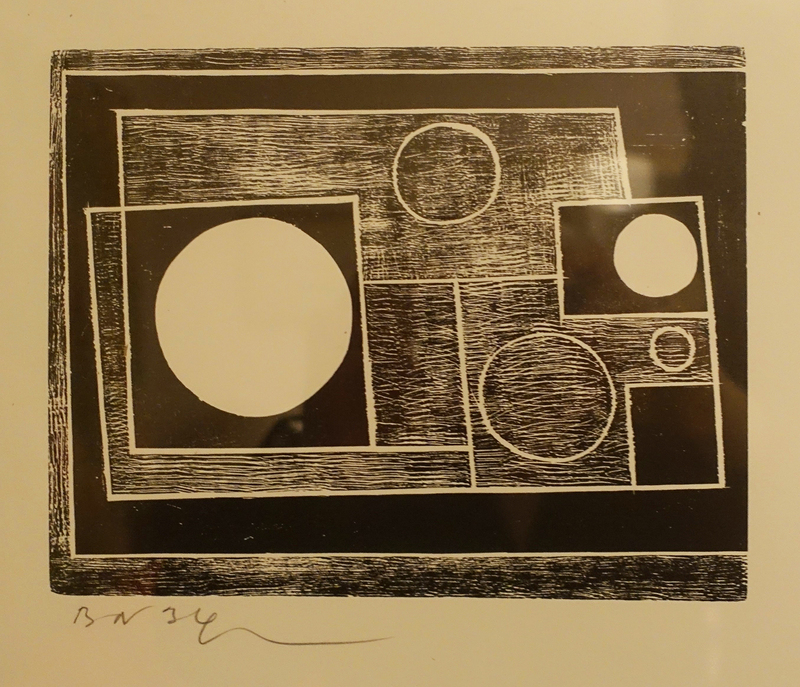 ‘5 Circles’ was the only woodcut he made before the Second World War. It was commissioned by Anatole Jakovski in 1934. Proof copies of this abstract print are known to exist and Nicholson must have preserved his block as a further reprint was produced by Kestner Gesellschaft in 1962. Entrance to this intimate exhibition is free thanks to the generosity of its sponsor, De’Longhi. 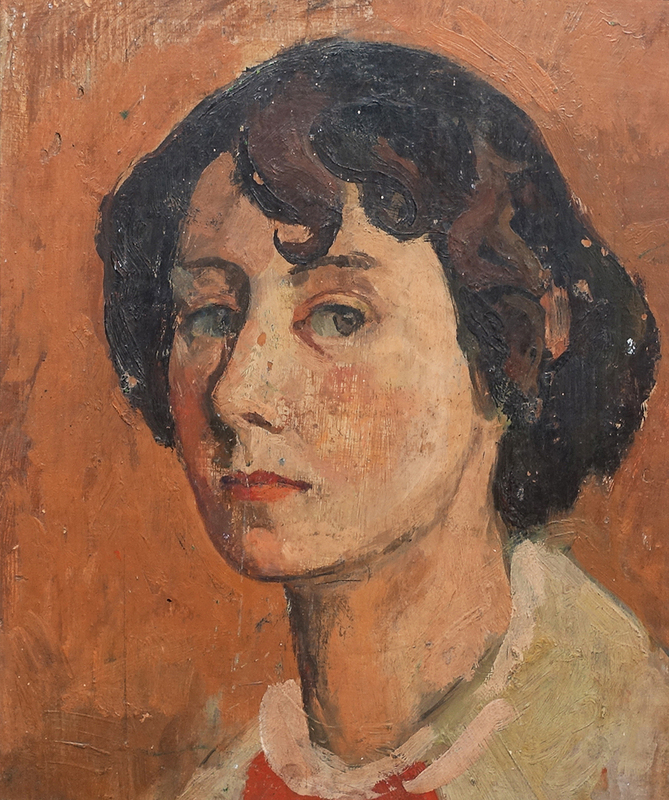 The show runs until 25th June 2017 at Pallant House Gallery, Chichester. Further details of this and the gallery’s other current exhibitions (which are really worth the ticket price) can be found at www.pallant.org.uk. 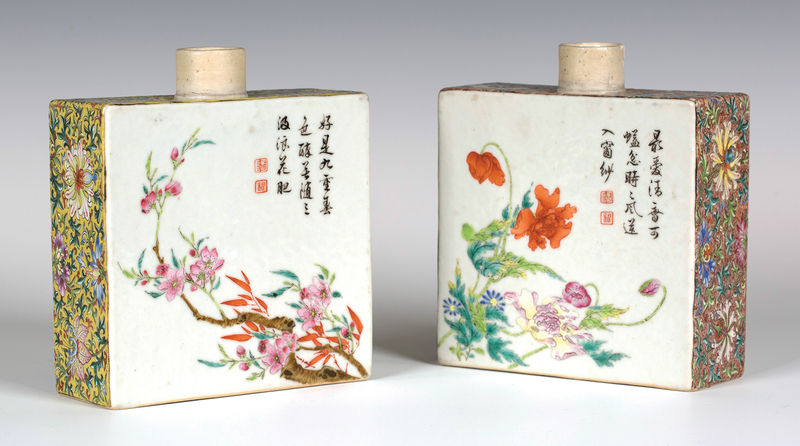 A pair of Chinese famille rose enamelled porcelain tea caddies dating from the Qing dynasty have just sold at Toovey’s Fine Art Auctioneers for £132,000. They were being displayed on a window sill in a Sussex home when they caught the eye of a Toovey’s valuer during a routine visit. 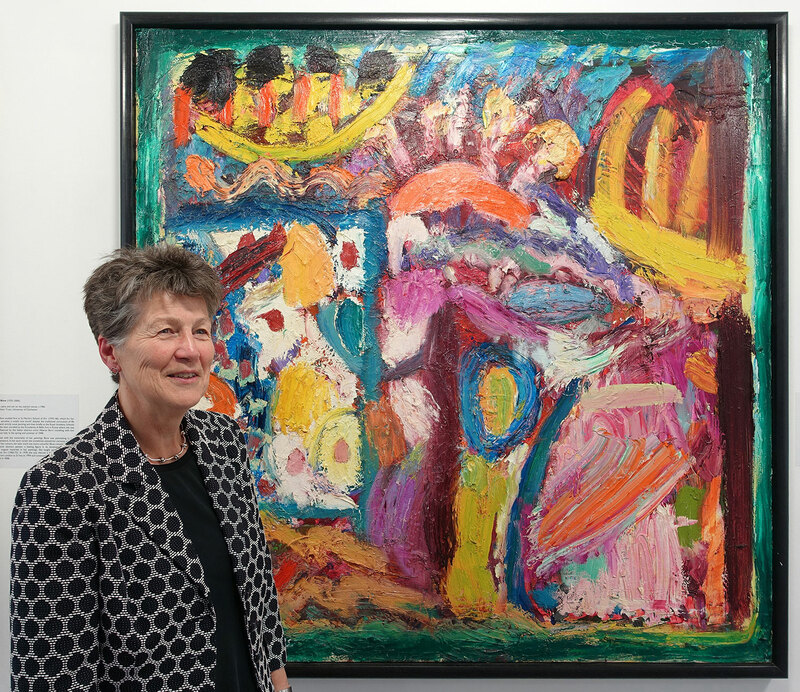 The result illustrates the strength of Chinese Hong Kong collectors and the benefits of the post-Brexit pound which have caused prices and competition from abroad to soar. Today’s Chinese collectors are following in the tradition of the Qianlong emperor (1711-1799) who was the last of the great imperial art collectors and patrons in Chinese history. His genuine passion for art and collecting seems to have been inspired by his grandfather, the Kangxi emperor (1654-1722), and his uncle Yinxi (1711-1758). The Qianlong emperor was prolific in his collecting applying an exceptional personal connoisseurship not only to the acquisition of art and antiquities but also to his patronage. His collection would number more than a million objects. It included the collection of the Ming emperors (1368-1644) which was the oldest art collection in the world with a continuous collecting tradition dating back over 1600 years. The Qianlong emperor took a personal interest in porcelain production and was an ardent collector of it. Many of the types of porcelain associated with the Qianlong emperor, however, were seeded under the Emperor Yongzheng’s supervisor of the imperial kilns at Jingdezhen, Tang Ying (1682-1756). Today’s Chinese collectors are as passionate in their collecting as their imperial forebears and the market shows no signs of abating. If you would like advice on your Chinese objects Tom Rowsell can be contacted on 01903 891955 or by emailing auctions@tooveys.com. Japanese inro were originally designed as seal baskets but were mainly used to hold herbal medicines. The interlocking compartments were held together by a cord and would have been hung from a waist band. 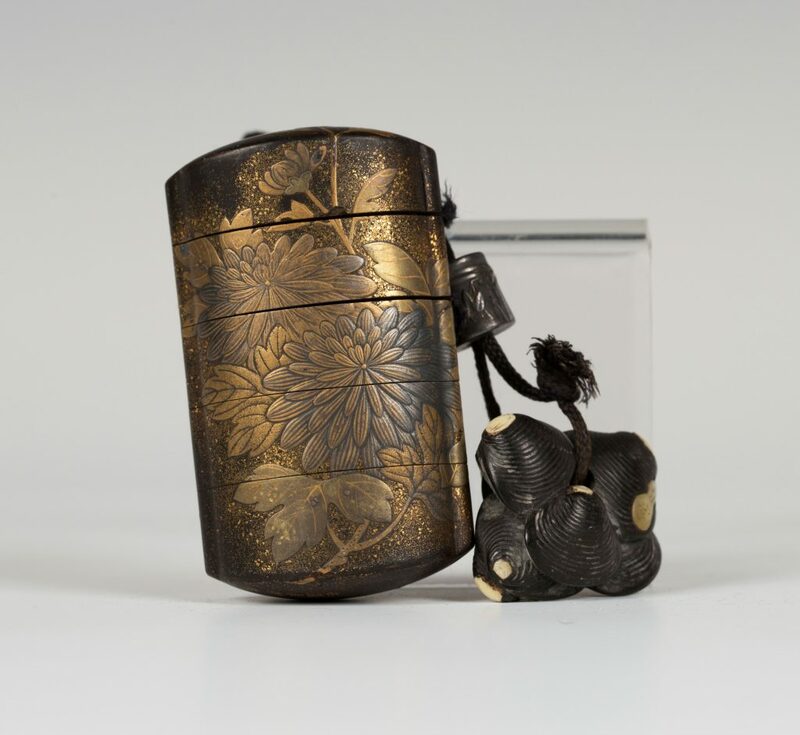 They were often finely decorated in lacquer and Shibayama. For more than two hundred and fifty years Japan had lived in relative isolation from the outside world until American gunboat diplomacy, instigated by Commodore Perry in 1853, opened up Japan for trade with the West. Throughout the Edo (1603-1868) and Meiji (1868-1912) periods Japan’s rich tradition of arts and crafts gave voice to a civilized nation. Amongst these arts and crafts lacquer work was used extensively in Japan. The technique came to Japan from China in the sixth century A.D. The art of the lacquer craftsman was highly technical but their patrons’ taste for traditional designs limited artistic creativity. The popularity of the inro emerged during the 17th and 18th centuries. 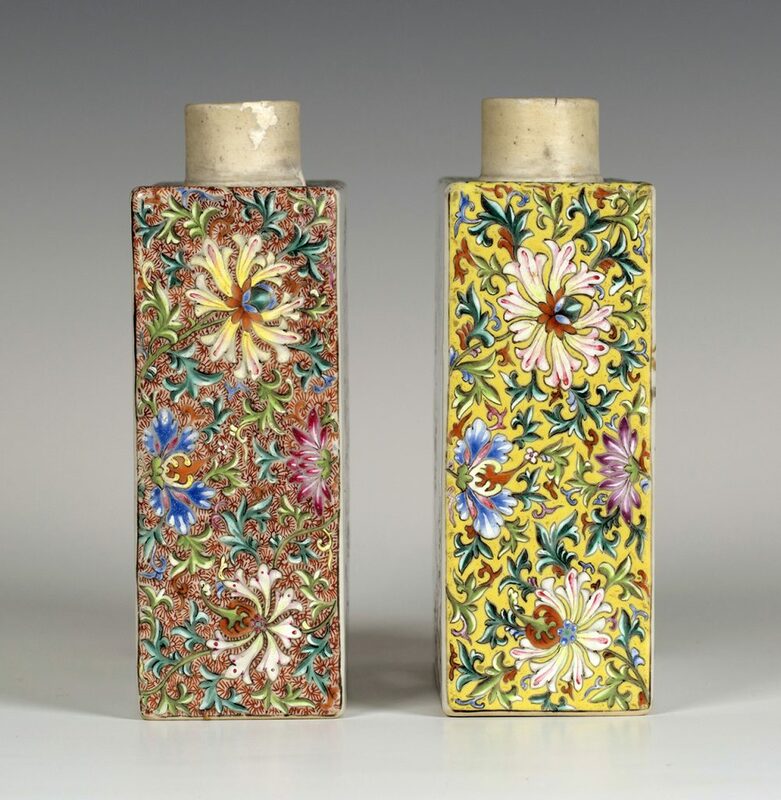 These new objects allowed the lacquerers a greater freedom in design and decoration as well as the opportunity to experiment technically. Exquisite artistry was lavished on inro by artist-craftsmen working for the ruling classes. Favourite subjects included figures, gardens and floral displays. 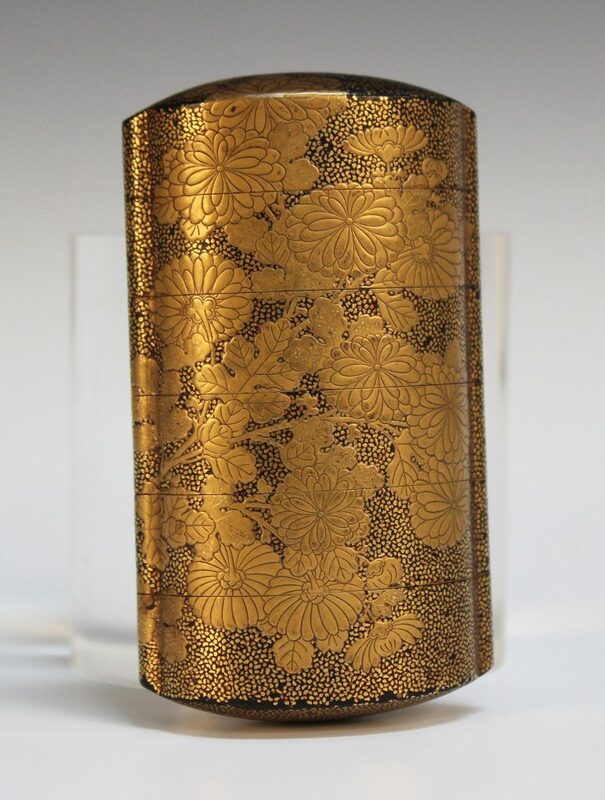 The Japanese lacquer and Shibayama inlaid five case inro illustrated here is a fine example of this artistic and technical tour de force. 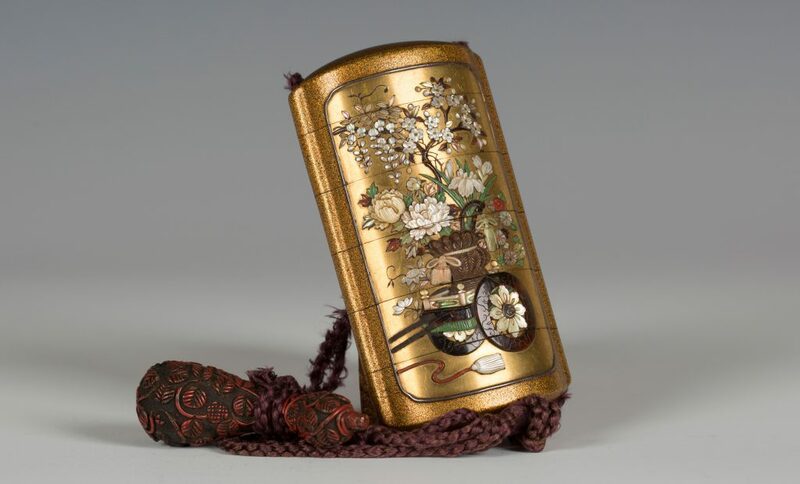 Measuring just 9.4cm the inro dates from the Meiji period (1868-1912) and combines the decorative techniques of maki-e with its powder gilt ground with Shibayama inlay. The high relief, finely inlaid image depicts a hanaguruma, a two-wheeled flower cart, carrying a tasselled wickerwork basket filled with chrysanthemum, peony, iris and a bough of flowering wisteria. The composition and colours of the scene depicted in carved tortoiseshell, coral, mother-of-pearl and hardstone are exquisitely conceived and worked. 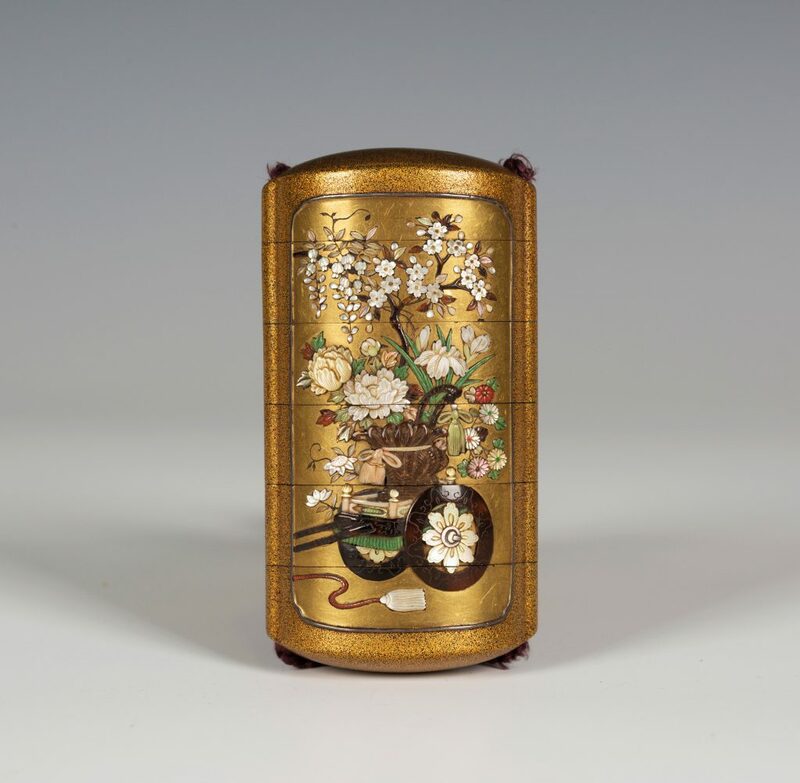 The Japanese four-case lacquer inro by Koma Koryu dates from the Edo period (19th century) and is differently decorated. The sides of its curved rectangular body are finely worked. Employing the hiramaki-e technique the gilt chrysanthemum are raised above the maki-e ground with its gilt speckled dark brown decoration. The hardwood netsuke is carved in the form of clam shells with ivory inlaid detail and the cord which unites the interlocking compartments can be clearly seen. The final Japanese inro illustrated dates from the Edo period. It again features chrysanthemums against a beautifully worked maki-e ground. Although lavishly decorated it is less fine than the other two inro. Values at auction for Japanese inro of this quality range from a few hundred to thousands of pounds today. 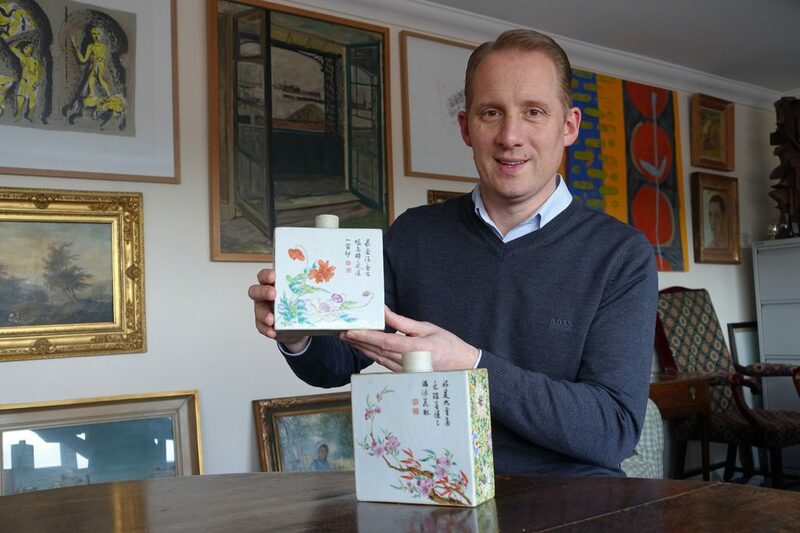 Toovey’s Asian Art specialist, Tom Rowsell, is passionate about these pieces and can be contacted by telephoning 01903 891955 or at auctions@tooveys.com if you would like his advice.